Removal of stretch marks in Era Esthetic laser dermatology clinic is carried out by three current year lasers of the latest generation: Fraxel Dual 1550/1927nm, pulsed dye laser VBeam Perfecta and Alexandrite laser GentleLase Pro. During pregnancy, between 75 and 90 percent of women develop stretch marks of varying degrees. They usually occur in the course of 6-7 month, in the third trimester, when the skin undergoes the ultimate tensile strength. A range of oils, creams, lotions are suggested in order to prevent stretch marks, however, the occurrence of stretch marks, their externalization is also influenced by genetic and hormonal factors as well dispersion properties of fat tissue and dermis fiber. Stretch marks do not cause any discomfort, however, they are aesthetically unattractive for those who have them. Treatment by Retinoids and AHA acids ensure only local effect. 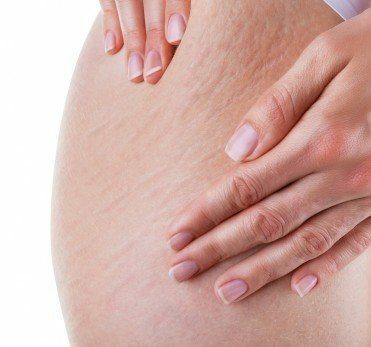 Both cosmetic and professional means providing local effect cannot reduce the actual stretch marks that have already formed. Mesotherapy and collagen injections require many treatments and, though changes are registered, they are minimal. Surgical removal – excess skin is removed during the operation together with the skin areas affected by stretch marks. Fraxel Dual 1550/1927 laser of new technology provides a range of entirely new opportunities for removal of stretch marks, scars and all major skin imperfections. This is a fractional two-wavelength Fraxel laser enabling double performance and developed for skin rejuvenation and defect correction. Its main difference from the earlier Fraxel versions is integration of a new 1927 nm wavelength to the new laser. This means, that during a single treatment the skin is affected by two lasers: 1550 nm laser wave affects the deep layers of the skin, which are hardly accessible when applying most other methodologies, while the 1927 nm wave is responsible for rejuvenation of the epidermis – the surface layer of the skin, as well as pigmentation correction. 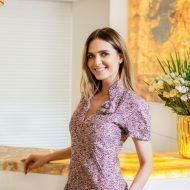 This way, making use of the effect of the two lasers, in the course of a single treatment, all layers of the skin are rejuvenated, therefore, a wide variety of skin defects can be corrected – all types of stretch marks and scars. Today, Fraxel Dual is considered to be the most effective for treatment of stretch marks and scars, skin rejuvenation. The laser creates thousands of microscopic columns inside the skin, while the skin around them remains intact. The body’s reaction to this is sudden healing by stimulating new collagen and skin cells’ synthesis. This way, through the treatment procedures, the skin with defects becomes replaced by completely new, healthy skin. Thanks to the patented technology, the post-procedural recovery time is minimal: it is possible to return to normal activities after 3-4 days in case of facial procedures, and the next day following removal of the stretch marks or scars in other body areas. The effect is already visible after the first treatment. The pulsed dye laser is considered to be unique due to its perfect ability to cope with everything RED effectively eliminating all the red and pink colors and their shades, while stimulating collagen synthesis – it is most effective for removal of fresh, pink stretch marks.